Mommy Jane attended the SushiVid influencer workshop on my birthday last Saturday . Mommy Jane always believe that knowledge had no boundaries. Even getting older now but Mommy Jane will always learn to enhance the existing skills. Held at the Bee, Publika, the social media influencer workshop was organised by SushiVid, a platform connecting brands to social media influencers. The workshop is full of sponsorship oppportunities with brands such as Hermo, b.liv, Havaianas, Lazada, Milo NUTRI UP, BLU, JBL, ZICO Coconut Water, Monster Energy and TagBooth. Youtubers (as below) were invited to shared on their experience working with brands and creative process in creating fun and interesting content while maintaining authenticity. Supported by the Malaysian Digital Economy Corporation (MDEC), Hasnul Hadi Samsudin, VP of Creative Content and Technologies, said that the focus has always been about growing Malaysia's digital economy and the new media space. They would like to support and create a complete New Media community that will learn and leverage on each other and hope we will utilise platforms like SushiVid to fuel our growth together. Foong said SushiVid's vision is to enable those who want to become a content creator to become a successful one. She said SushiVid successfully paid out RM293,000 to long-tail influencers in the span of 10 months. She also announced SushiVid's future plans will includes new blogger integration and the introduction of a monthly pricing plan for brands wanting to engage in influencer marketing. Tan Sri Vincent Lee, Foetus International group executive chairman, had officiated the workshop with Hasnul and Foong. Tan Sri Vincent Lee also shared with us the reason he choose SushiVid for collaboration. After that, there was a sharing session by Roberto Mata, Head on Online Marketing of Lazada on how they have been collaborating with social media influencers in their marketing campaigns. He shared that they are looking for the originality of the content when it comes to appointing the influencers. SushiVid is an influencer marketplace that connects brands to social media influencers and with over 500 content creators, SushiVid helps brands scale and simplify the process of launching and managing an influencer campaign by providing YouTube analytics to gauge the effectiveness of a campaign. 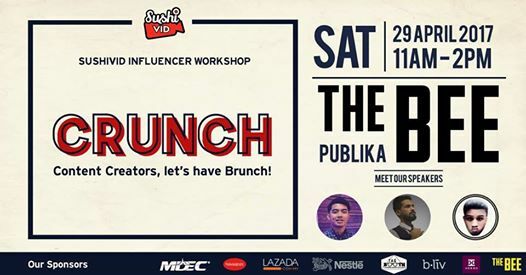 SushiVid has created over 100 campaigns in one year and has collaborated with brands such as Digi, Lazada, Shopee, 11Street, Bonia, Lelong, Watsons, TP-LINK, Panasonic, DBS Bank, Uniqlo, Hermo, b.liv, Havaianas, Shopback, Propsocial and many more. SushiVid is also a graduate of the MaGIC Accelerator programme and DBS Hotspot Pre-Accelerator in Singapore in 2016 and also the Official Initiative Partner for MDEC's #MYCYBERSALE 2016. SushiVid is also recipient of the Cradle Grant CIP500. Their past campaigns include Lazada 5th Birthday, Capture App (Digi), NIDA Rooms and Hermo. For more information, do check out their website at www.sushivid.com and facebook page at www.facebook.com/SushiVid. Thanks to SushiVid for organising such a great workshop to all the influencers like Mommy Jane. Thanks for the lucky draw prizes where Mommy Jane won a BLU smartphone and thanks also to everyone present for singing a birthday song to me. It is indeed an informative workshop and a great time spend with all the organiser, sponsors and all my blogger friends. Mommy Jane hope to grow further to bring my blog to a higher level and with the helps from SushiVid, I'm sure my dream will comes true one day. Mommy Jane will work harder after this for the benefit of my 5 Little Angels. fun workshop with friends and also get to learn. hope thy do this again! Sherry, agreed with you. Hope to see you at their event again too. What a wonderful event to bring together social media influences from different levels of popularity. Would love to attend and meet some of the famous YouTubers. Emily, hope SushiVid will organise it again and will let you know ya so that you can meet them in person. Zayani, as mentioned in the post, they look for orginality of the contents and how we presented it. Such a great opportunity to be a part of this workshop and also connect with other influencers! Everest, definitely agreed with you on this. We made lots of friends and Companies here. Yana, they are really sweet and I don't expect that too. You should join also mar since so near to connect with each other. i miss the best event. how i wish they will have more events. Waa Happy Birthday Jane. I miss out this event, it looks good and very informative as well.